The Karlberger enjoys a superb location overlooking Kitzbühel. 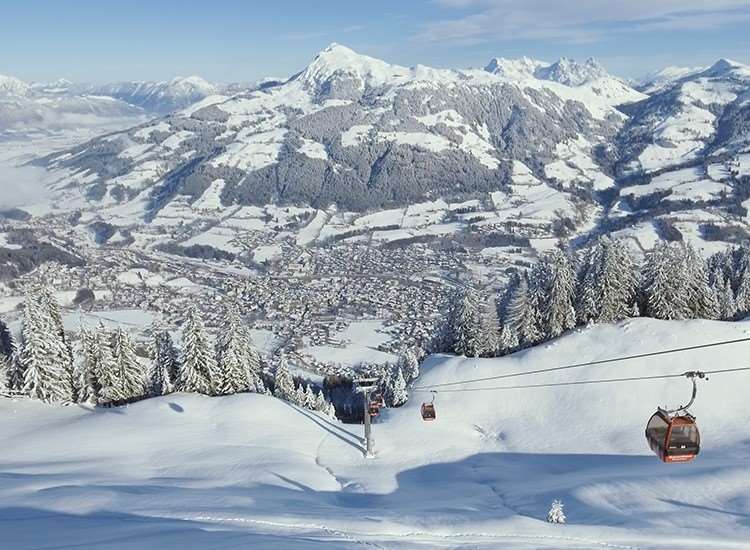 With the ski school and Hahnenkamm lift almost on your doorstep, the chalet is an excellent choice for those looking to get out early on the slopes. The dining room is bright and airy with large windows affording excellent views over the town. Ground floor: Entrance hall, lounge/dining room with open fire and views over the town. Twin room with Austrian twin beds, private bath and WC located in corridor outside the room (16). First floor: Twin room with Austrian twin beds and washbasin (1), shared shower and WC opposite in hallway. Twin room with separate beds, en suite bath, WC and balcony (2). Two triple rooms with en suite bath, WC and balcony (3 & 4). One double room with en suite shower, WC and balcony (5). One double room with en suite bath, WC and balcony (6). One twin room with separate beds, en suite bath and WC (7).Twin room with separate beds and washbasin (8), shared shower and WC opposite in hallway. Second floor: Two triple rooms with Austrian twin beds, single bed, en suite shower, WC and balcony (9 & 12). Two twin rooms with separate beds, en suite shower and WC (10 & 15). One single with en suite shower and WC (11). Quad room - sleeps 2-4: Located next to the chalet (separate entrance). Consists of one twin bedroom, living room with table, chairs and two single beds plus en suite bath and WC.